If I do not manage to get my house empty before the holidays, there will be a short period in June that we have four ‘houses’: my house in Doorwerth, the caravan in Newmachar, the truck and the boat. All four ‘houses’ need to have at least the bare necessities: bedding, towels, food stuff… So today I start repacking a lot of the boxes that were ready for shipping. And a lot of things destined for the second hand shop in Holland will now end up in a second hand shop in the UK. First priority is a full inventory for the boat. Luckily for me Black Prince provides it’s customers with an inventory list of their boats, and I use this list as a starting point for everything we will need while cruising from Overwater Marina to Scarisbrick. The “What-to-take-with-us-list” from last year’s boating holiday reminds me of other essentials. 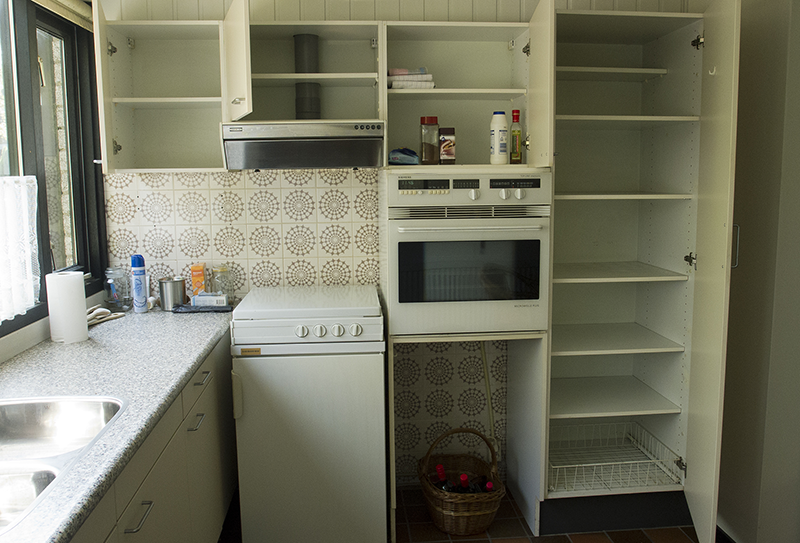 And my (now enormous) experience with cleaning things in Doorwerth provides me with even more stuff. Everything has to come out of my inventory, because we have to leave the inventory of the caravan as it is. We need that when we’re back in Newmachar to collect most of the stuff from there. Besides that, Lawrance will still need it when he’s doing his last working days in Scotland. Transporting the bare necessities every time up and down between Scarisbrick and Newmachar might also take too much precious space in the car. And I don’t want to loose extra days before we take over the boat just for packing stuff out of the caravan. When the holidays start, we just throw the boxes labelled “Boat” in the car, together with our clothes and things, and that’s us ready to rock and roll. 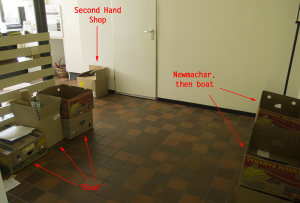 So now there are boxes labelled ‘Boat’, boxes labelled ‘Newmachar, then boat’ and boxes labelled ‘Second Hand Shop’. All the stuff for the skip is piled up in the garage. As are the voluminous things for the second hand shop. But I think I can be proud of myself. I’ve got almost two weeks left before I’m probably leaving for Scotland (depends when Lawrance is in Holland), and my kitchen cupboards are virtually empty.